.250" ID x 3/8" OD Blue High Pressure Flexible Nylon 12 Tubing | U.S. Plastic Corp. 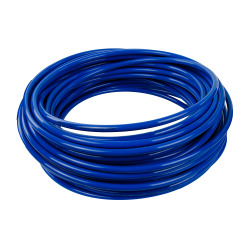 This blue, high pressure Nylotube® tubing is resistant to solvents, alkalies, oils, greases, petroleum products, fungus and molds. It has generally good resistance to dilute mineral and organic acids, but in-plant tests are recommended.